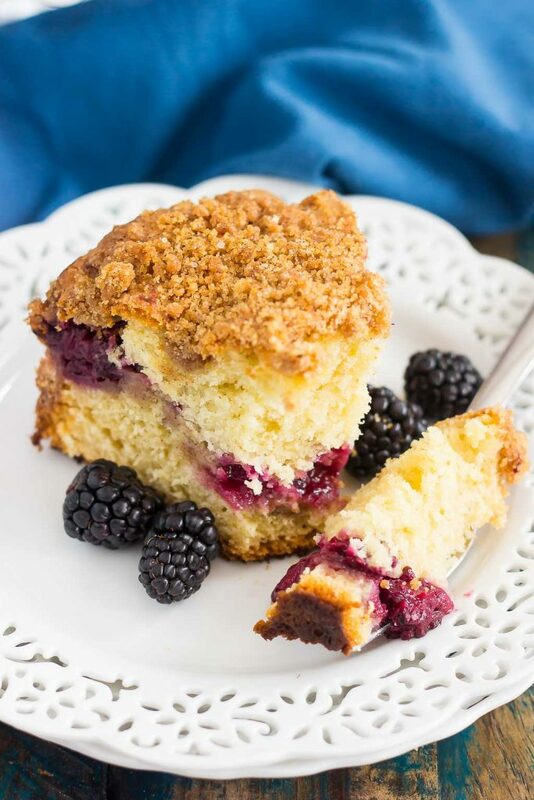 This Blackberry Crumb Coffee Cake features a soft and moist cake, filled with a layer of cinnamon streusel and juicy blackberries. Sprinkled with a crumb topping and baked until golden, this coffee cake makes a delicious breakfast or light dessert! Last week, I shared this No-Bake Peanut Butter Cup Cheesecake, and this week, I’m sharing a crumb coffee cake! Since it’s summer, I feel like lots of cake is needed. Am I right? Well, cake is needed pretty much any time of the year, but since I specifically love eating cake for breakfast, coffee cake is pretty much the best kind there is. It has just the right amount of flavor and fruit, which makes it just a liiiiitle bit healthier for breakfast (play along with me, please!) and it’s also sweet enough for a light dessert. The hubster and I love coffee cake. As in, we could eat it every week if we let ourselves. Which we don’t, so not to worry! But, want to know a secret? We buy a lot of store-bought coffee cake. I feel guilty just saying those words out loud since I’m a food blogger, but sometimes, it’s just easier to buy the cake. Well, not anymore! 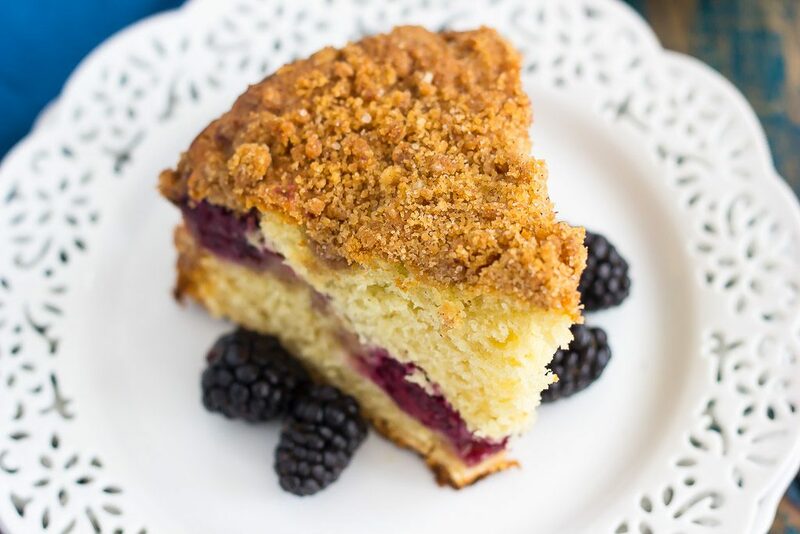 Thanks to this Blackberry Crumb Coffee Cake, the hubster and I eagerly ate our way through this entire coffee cake in just a few short days. It’s just that good, friends! No need for the store-bought kind, as this homemade version is about a million times better. And I’m not just saying that because I made this…pinky swear! If you’re anything like me, the crumb topping is what makes a coffee cake unlike any other dessert. It’s sweet, sugary, cinnamon-y, and all-around delicious. 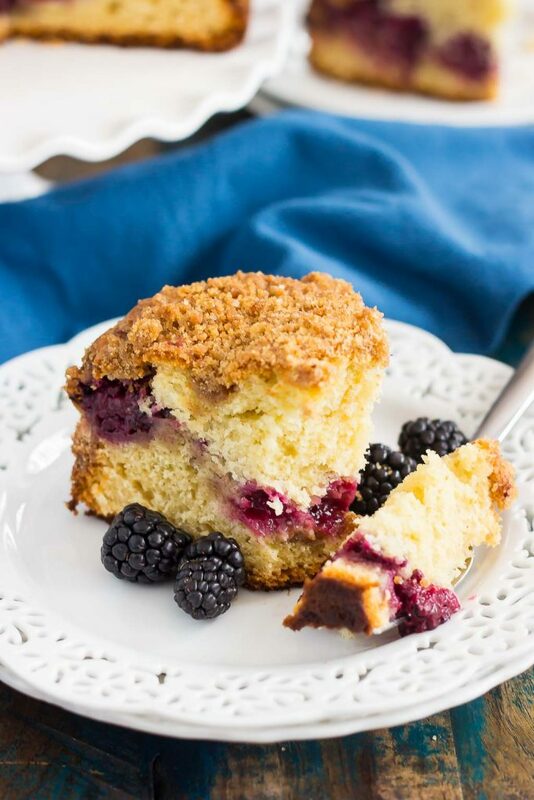 This Blackberry Crumb Coffee Cake is loaded with a crumbly mixture inside the batter and on top. So you get double the deliciousness! Sounds pretty good, right? And blackberries. Let’s talk about blackberries! I love them, but I almost feel like it’s a forgotten fruit to me. Sure, I use it to make my No-Bake Blackberry Cheesecake or to munch on as a snack, but I don’t use it as much as I should in baked goods. So, I’m changing it up and trying to bake with it more this summer, starting with this coffee cake. 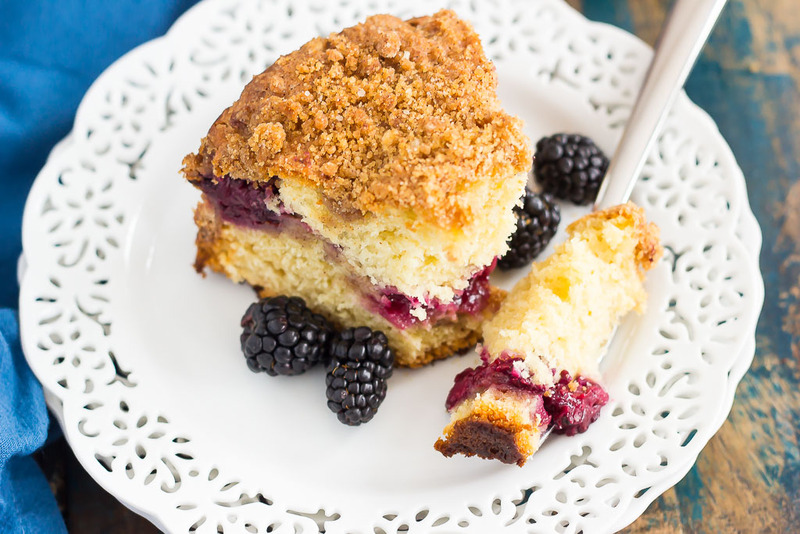 And like most of my recipes, this Blackberry Crumb Coffee Cake is a breeze to whip up! You can have this cake prepped and ready to be devoured in no time. 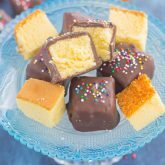 It makes a tasty breakfast or delectable dessert, with its light texture and sweet flavor. It’s also perfect to serve for brunch or for when you have a house full of hungry house guests! Looking for more coffee cake recipes? I’ve got you covered! Slowly add in flour mixture and stir until just combined. Spread 1/2 of batter on the bottom of prepared pan. Top batter with 1/2 of crumb mixture, followed by blackberries. Spread remaining batter on top of blackberries. Sprinkle rest of crumb mixture on top of batter. Bake for 54-58 minutes, or until toothpick inserted into middle comes out clean. I used an 8 inch cake pan to yield a thicker filling, but feel free to use a 9 inch pan if you like a flatter cake. You know that I will NEVER argue with cake, right? It's the best, especially the crumb kind. I have been known to hog all the crumb. Have a great holiday weekend, Gayle! Thank you, Mir! Hope you have a great weekend, too! Lots of cake is DEFINITELY needed, especially on a long weekend! And this one looks like crumb-cake perfection! Hooray for cake! Thanks, Kate! 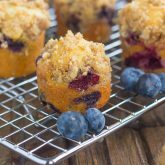 Gayle, I love a good coffee cake and this one. . this crumb topping and the blackberries looks amazing!!!! love this cake! have a great 4th!!!! Thank you, Alice! I just can't resist crumb toppings. Hope you have a wonderful 4th, too! That crumb topping looks so good! What a delicious cake for a brunch! What a beautiful coffee cake! I wish I had a slice to go with my coffee right now! Coffee and coffee cake make the best combo! Thanks, Jessica! 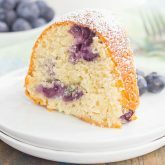 Coffee cake is just the best- I've never had a slice with blackberries, so I've gotta make this! Who could resist all that crumb? 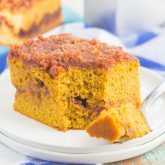 Coffee cake (and all breakfast sweets, actually) is one of my favorites! Homemade is always best, and I'd love a slice of this blackberry coffee cake! That crumb topping looks perfect! Thanks for the coffee cake love, Kristine! Love a good coffee cake like this one! Looks delicious and the blackberry layer! Have a great holiday weekend! Thank you, Mira! Hope you have a great weekend, too! The smell of homemade coffee cake coming out of the oven is one of those things that makes me instantly happy. The blackberries! The topping! This is just perfect. I can never pass up coffee cake. And then you go and put blackberries in the middle making it even more irresistible. I must have a slice, STAT! Coffee cake and blackberries were meant to be together! :) Thanks, Jen! I'm with you -- cake for breakfast!!! It's my absolute favorite and homemade coffee cake is SUCH a treat! You are exactly right...there is never a bad time for cake! And I love your thinking about the yogurt in here. Thanks for the kind words and pin, friend! Happy weekend to you, too! This looks SO wonderful, Gayle! I love blackberries, especially in desserts like this. ???????????? YUM. I am a huge coffee drinker and this would be the perfect complement to my first cup after dinner! Love that crumb!! Thanks, Annie! I'm all about the crumb topping! I an just imagine settling don on a cold autumn afternoon with a HUGE slice of this and a big mug of coffee. The crumb topping sounds amazing. 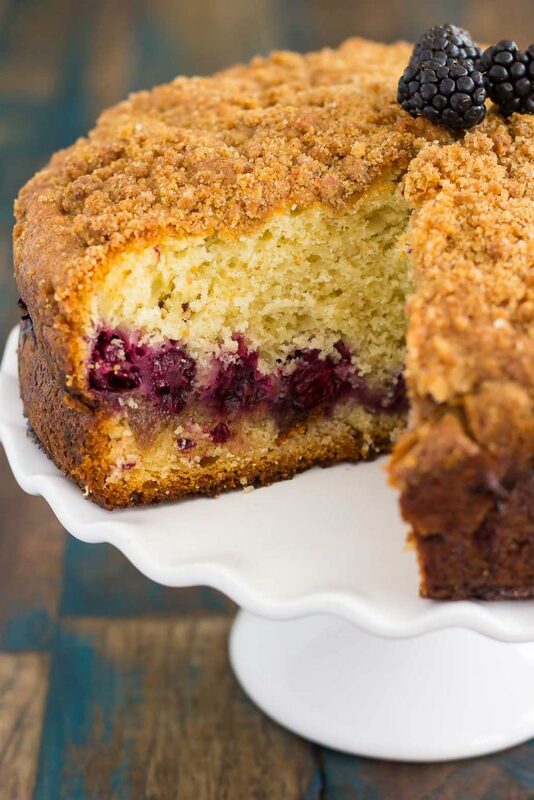 I can never resist coffee cake especially with a glorious crumb coating like yours, Gayle :) Looks so delicious and I love all those fresh pretty blackberries! Haha yes...research! :) I like it! Thanks for the kind words and pin, friend! Wow! This is beautiful! I will have to try this recipe! Thanks for the kind words and for stopping by, Emily! Hi Asiya! I'm so glad that you enjoyed this cake! That is a great idea to added brewed coffee. I'm going to try that next time! Thanks so much for letting me know how it turned out!